Washing the pea gravel was a bit of a pain, but I ended up drilling holes (three cheers for power tools) in the bottom of a Rubbermaid storage bin (like, a ton of them), dumping in a bag of pea gravel at a time, and washing it with the hose (and mixing it up with my hands) until the water pretty much ran clear. I ended up only using three bags of gravel – so filling the box only cost about $10. The result? Absolute JOY!!! 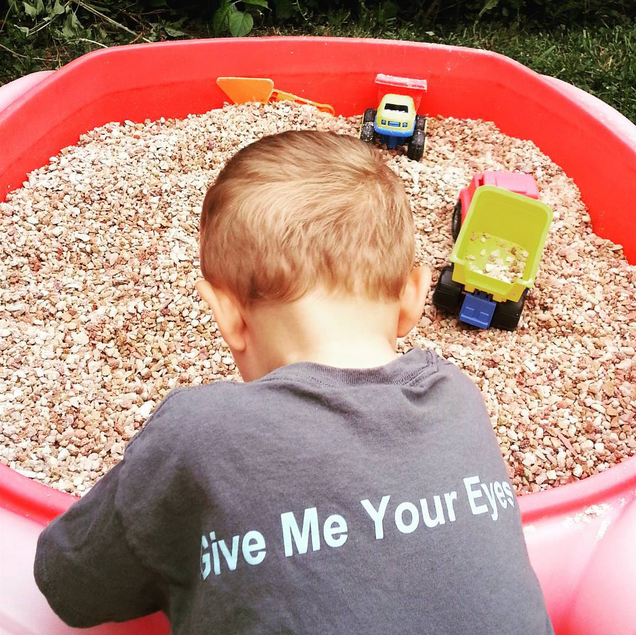 Inevitably, handfuls of rocks have already been thrown… and I’m happy to report that gravel to the face hurts FAR less than cancer sand in your eye. Good job! Enjoy your activity boy!